IncentiveWorks 2018 in Review - Redstone Agency Inc.
As the 2018 IncentiveWorks slogan goes: “Connections make great meetings.” IncentiveWorks unites meeting and event planners nation-wide, allowing attendees to develop connections, grow their networks and enhance their networking capabilities. If you’re an intermediate networker, begin next year’s Canadian Meetings & Events Expo by shadowing a senior colleague with expert networking skills. First, study how this expert interacts and connects with industry peers. Next, force yourself beyond your comfort zone by independently exploring the tradeshow floor and developing your own connections. As you interact with new people over the course of the two days, you will refine your elevator pitch and make valuable connections with other planners and suppliers. Complete some prep work in order to amplify your networking experience at next year’s conference and tradeshow. 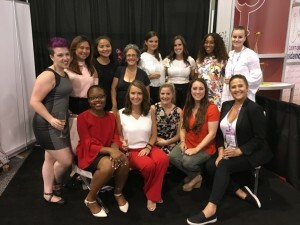 This year, IncentiveWorks partnered with EventMobi to develop a mobile app that enabled attendees to create quality connections by blending in-person and digital networking. This allowed attendees to develop their connections beyond the tradeshow floor by interacting with registrants and scheduling appointments with suppliers in advance. Planners should also keep in mind that many exhibitors and partner organizations associated with IncentiveWorks organize events to coincide with the two-day conference and tradeshow. Most of these events are by invitation only, so planners should ensure that they connect with their existing suppliers in order to get an invite. Attending these additional events will allow you to kick-start your connection building before the conference and tradeshow begin on Tuesday morning. ARHT Media demonstrated its incredibly realistic holographic telepresence technology. Transport a speaker to your next event from anywhere in the world! Niagara Falls Business Events partnered with Pinpoint National Photography to offer a headshot salon to attendees. Are you planning an upcoming AGM and are struggling to meet quorum? Persuade your members to register by offering them a complimentary updated headshot! Purchase the full-access Conference Pass to enjoy the luxury of choosing from more than 12 education sessions and four keynotes. The education sessions are applicable to all experience levels and also allow you to earn CE credits towards your CMP application or re-certification. Your session selections should be strategic. Before selecting which sessions to attend, review the entire agenda, research each of the speakers and reflect on areas that you feel require development. Congratulations to Redstone’s CEO, Carly Silberstein, for her nomination in the Volunteer and Planner categories. Carly is honoured to be recognized alongside such inspiring and accomplished industry volunteers and planners. Congratulations to Redstone’s Senior Account Coordinator, Nzinga Brown, for her nomination in the Rising Star category. Nzinga is a vibrant and dedicated event and association professional and Redstone is thrilled that she was recognized for the profound success she has achieved at this early stage in her career. The #REDSQUAD looks forward to attending the new and improved Canadian Meetings & Events Expo as IncentiveWorks rebrands and enhances its influence for 2019. We hope that this set of guidelines will allow you to maximize your experience at the 2019 conference and tradeshow! What were some key takeaways that you gathered at IncentiveWorks 2018? Leave your comments below! Maggie is a Senior Account Coordinator at Redstone Agency. As a goal-oriented and exceptionally organized individual, she prides herself on her ability to manage various client accounts with diplomacy and creativity in order to provide individually tailored advice for each of her clients. Maggie's meticulous attention to detail and her proficiency in strategically managing relationships ensures that she consistently delivers an unparalleled client experience.